Are you having a problem with running out of power or battery? 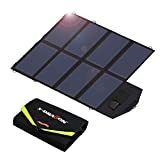 We all need power, but we always seem to run out of it, either because we choose to enjoy nature away from the grid, or in disaster scenarios, the grid chooses to get away from us.We provide you a list of best solar power chargers to your difficulty. Backed up by a whopping 19,800mAh battery, the Voltaic system’s 20W solar charger kit packs a punch when it comes to charging devices. This waterproof and scratch-resistant solar charger offers enough juice to fully charge a laptop in around 6.5 hours (smartphones can see a full charge in 60 minutes). Weighing 3.25 pounds, the Voltaic system isn’t as lightweight as the competition, but it’s still highly portable. Measuring 7.5 x 10 x .8 inches, it remains compact enough to tuck away into a bag for on-the-go use. The total battery life can handle one full laptop charge, seven smartphone charges, 3.5 charges to DSLR batteries and nearly two full charges for a full-sized iPad. The 73-watt solar cells can re-charge fully in around 6.5 hours. Solar Paper is super small and slim, so you can conveniently carry the solar paper when traveling or even in daily life and use solar energy anywhere under the Sun. It can fully charge iPhone 6 within 2 and a half hours. Solar Paper is the world’s first solar charger that can auto-reset by a comparison operator, so you don’t have to worry about shadow or cloud on solar panels. It also allows users to know exact power amounts via numbers displayed on the LCD screen. 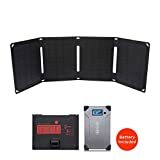 Various devices such as GoPro, external battery, Bluetooth speaker, digital camera, AA battery charger, flashlight, smartphones, and even tablet PC that requires more power can be charged by adding additional panels. Magnet connectors help to conveniently add or subtract solar panel. The highly efficient Wildtek 21W portable solar charger is a solution for staying charged no matter what environment you find yourself in. Compatible with a slew of devices (thanks to its dual USB ports), the Wildtek offers ultra-efficient solar cells resulting in faster charging time that’s nearly two times quicker than competing models. Measuring 6.6 x 12.4 x 2.2 inches and weighing 2.1 pounds, the Wildtek folds flat to charge and re-charge and folds right back up for extra portability and smaller storage. The built-in stand helps you find the perfect angle to absorb as much sunshine as possible for the fastest re-charge time. Easy to fit into a backpack or clip to a bag with the included carabiners, the Wildtek is IP65 rated as one of the first fully waterproof solar chargers available today (it’s also dustproof). Thanks to a super-sized 40W solar panel charger, the X-Dragon offers a beefy 2.8A (Amps) of power capable of re-charging smartphones, tablets, and even some smaller laptops. Built-in to the X-Dragon is a 5V/2A charging port for a 5V gadget and a 18V DC output (18V/2A) for charging a laptop or other 18V powered devices. Fortunately, all that extra juice doesn’t mean an unwieldy size; the X-Dragon maintains a slim and foldable profile that’s easy to carry around. It can go in or on a backpack with the included carabiner that hooks directly to a bag. The 10-in-1 connector cables enable it to charge just about any type of device, while the incorporation of SolarIQ technology helps achieve the appropriate current and voltage to deliver max power. Ultimately, the X-Dragon is an ideal combination of portability and power that can keep you going for days.